Joanie's Classy Card Corner: I'm Baaaacccckkk!!!! Well, let me start off first with wishing each and every one of you a Very Happy, Healthy and Blessed New Year!! Now for some good news, I have been invited to join the Brown Sugar Challenge Team. Yayyyy!!! An "Awesome" way to start off the New Year!!! So let's get started and get to the Challenge. Our theme for for this challenge is "Bears". And cute bears I must say! Here we go!!!!! Are these not the most adorable Teddy Bears you've ever seen? So cuddly!!! Well, you can get yours and lots more at Crafty Sentiments and Designs! 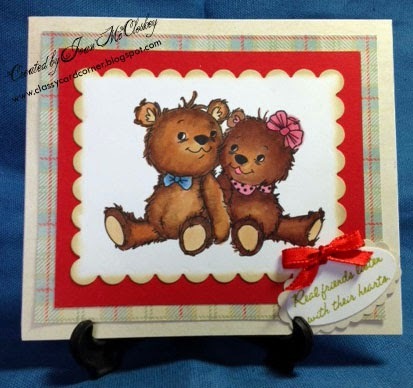 I used the digi from Crafty Sentiments and Designs "A Gentle Touch." The papers I used are from Recollections "All Girls" Pack. The sentiment is from Close to My Heart "True Friends". The oval punches are EK Success. The Scalloped punch is from Spellbinders. I used my Copic Markers for coloring. So not why not start your year off and join in the fun at Brown Sugar Challenge and you may be the first winner of the year!! See Ya!! And good luck!! !